Melissa ErricoAs a fellow Long Islander, I have known of Melissa Errico for almost half my life. First as the daughter of orthopedic surgeon Dr. Michael Errico, then as a Tony nominated Broadway actress, and now as a recording artist. I'm so excited to have the chance to interview Melissa about life on Long Island, her new live album What About Today: Live at 54 Below, her upcoming Joe's Pub show Sing The Silence, and her role on Showtime's new show Billions starting in January! Click here for tickets to Melissa's Joe's Pub Show Sing The Silence on November 18 & 19! To purchase Melissa's live album What About Today: Live at 54 Below click either Amazon and iTunes! For more on Melissa be sure to visit http://melissaerrico.com and follow her on Facebook, Twitter, and Instagram! CD Design by Robbie Rozelle1. You have so much going on right now...between your live album What About Today: Live at 54 Below that was just released, your upcoming Joe's Pub concerts Sing The Silence and filming the new Showtime series Billions which premieres in January. How do you keep up with everything and stay healthy while so busy? Lots of sleep (Umm, or nice times in the dark) and an operating knowledge of a gmail calendar. My husband and I try to think positive and I teach the kids to go to bed every night thinking of "three good things that happened today, and three things that they look forward to about tomorrow." 2. Let's start with your live CD that was just released, What About Today, which was recorded at 54 Below. This is your first live album. You have performed concerts for years prior to this show, what made this show the one you wanted to record onto an album? It was a kind of culmination of the last few years -- the release of my Michel Legrand CD, a deepening commitment I feel to Sondheim, and generally my returning to Broadway with a sort of renewed passion after having three children. Stylistically, it also has a lot in it that feels like me -- I'm pretty eclectic in my tastes, and this band could get pretty evocative. Melissa ErricoThis live show has movie songs, theater songs and a few flashbacks to Broadway musicals I was in and never recorded. It has one of my own compositions in it and a throwdown tribute to Eydie Gorme. My director of this show was also a tremendous friend and teacher (not to mention he cast me as "Cosette" in Les Miz when I was 18, so he's known me a long time) and has been pushing me vocally for a few years, encouraging me to open up my vocal range and use it all from soprano to really stretching my belt voice. He also just wanted me to let go and entertain and not watch over my own shoulder. There is definitely a freedom, or why else would I have worn those mini shorts!? Oy vey! There is more I can do musically. There is another layer I want to do in future, but this live CD feels good and I hope you like it. Nothing is ever perfect. Every time I do something, I start to think what I would like to add, to try more of, to learn to do, to do next. I also wanted to dedicate it to Danny McNie, a young actor who was with me every night backstage and who died suddenly this year. He lived through a lot of hard things, and a hate crime, and he was my assistant during this concert run. He and I laughed and cried and untangled my millions of necklaces, and discussed patter and life. I loved him dearly. He moved to Hawaii to sing on a cruise, and had an accidental death after a few months away. My heart is in a million pieces every time I think of him and I wear a bracelet every day to always remember his talent and friendship. This CD is dedicated inside to him. I needed to give this to him and to his amazing mother. Melissa Errico in Classic Stage Company's revival of "Passion"3. Since the show was called What About Today? What is something you discovered about yourself today that you wish you knew at an earlier stage in your life? To work for what fulfills me, not for what expectations I seek to be fulfilled by working. You've heard of the book Eat Pray Love? I'm gonna write: Eat Pray Sing. 4. This November, you are doing two concerts at Joe's Pub entitled Sing The Silence, about the time in your life, when due to a vocal injury, you had to withdraw from Passion and be on 100 days of vocal rest. What was the hardest part about being on complete vocal rest? Did you ever think you might not be able to sing again? How did it feel the first time you sang after that 100 days? What steps do you take now to protect your voice? This information will cost you a $25 ticket. 5. You are also in the midst of filming the Showtime series Billions, a complex drama about power politics in the world of New York high finance. Firstly, what made you want to be part of this show? Secondly, the promo video shows us the tag line "Follow The Money." When was there a time in your career you took a job just for the money? What was that job and was it fulfilling? I lived in LA for a few years and NBC had written a sitcom called NEUROTIC TENDENCIES about a downtown New York actress studying acting at NYU who meets an older man who is a Hollywood producer. They are hailing the same cab and get into a "fight" and then share the taxi, and a December/May romantic comedy begins. I got cast in the leading role. It was really charming, and I wouldn't say I did it for MONEY per se, but it would have been awesome if it got past the pilot stage. I would be living on an island in Greece now. Melissa Errico in "Amour" on Broadway6. You've done theatre, film, television, recordings, and concerts. What have you not done yet that you would like to? Write. I like writing. I have a few novels in my head, but everyone says that. Dare me. 7. As a fellow Long Islander, I loved Adventureland, Hildebrandt's Restaurant, and Laces, the roller rink. As a child on Long Island, what were some of your favorite places to go? LACES!!??? OMG I am in love with you, period end of story. LOVE. Okay: also loved Louies restaurant in Port Washington, and the Roosevelt Field mall. I took gymnastics at a place in New Hyde Park called The Sport of The Future. I always thought that name was so cool! That was around the time I asked my Mom to call me "Nadia." Melissa Errico8. Growing up, you spent many summers at an arts camp. Which camp did you go to and now, looking back, how do you feel that experience prepared you for life as an actress today? French Woods camp was a magical time for me. It prepared me to learn things really fast. I don't know how on earth I thought it was FUN to memorize EVITA in two weeks, but that was my idea of a good time. We did a full musical every three weeks and I literally could not get enough. (Jason Robert Brown was "Che," by the way. He was so passionate about musicals too -- he did everything...playing piano, dancing, singing, he was really incredible). The community of that camp was really special. We are a bit of a clan now, even if we don't see each other much. We all know that we kept each other company during teen years when so many people were maybe lost or busy partying. We were busy learning the lyrics to everything under the sun. 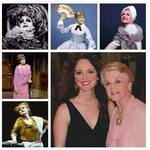 Melissa Errico and Angela Lansbury9. One of your idols is Angela Lansbury. If you could go back to any moment in her career, what moment would you choose and why? Angela Lansbury in MAME. I want to see her slide down the bannister. 10. On your album Blue Like That, you recorded "Keep it to myself." What is a secret you have kept to yourself that now you are able to reveal? Again, you may need to buy a ticket to Joe's Pub and see if you can hear it. P.S. lets go to LACES!!!!! Melissa Errico, Tony Award® nominee, has starred on Broadway, on network television and film and is an accomplished recording artist and musical concert performer. Last season, Melissa played the recurring role of "Catherine" on the Stephen Soderbergh show The Knickfor Cinemax, and had guest arcs on Blue Bloods and The Good Wife. Her Broadway credits include starring roles in My Fair Lady, Dracula, White Christmas, High Society, Les Miserables, Anna Karenina and Amour for which she was nominated for a Best Actress Tony Award®. She starred in Stephen Sondheim's Passion and Sunday In The Park With George. She has released three studio albums: Blue Like That (EMI Records) produced by Arif Mardin, Legrand Affair (Ghostlight) produced by Phil Ramone, and Lullabies & Wildflowers (VMG/Universal Records) produced by Rob Mathes; and a recent 3-song digital single More Lullabies & Wildflowers to benefit her charity. Through everything, she stays devoted to her loving family including her husband, tennis player Patrick McEnroe, their three young daughters, and one Yorkie!